They will come and they will stay if you give your fans good reason to engage. 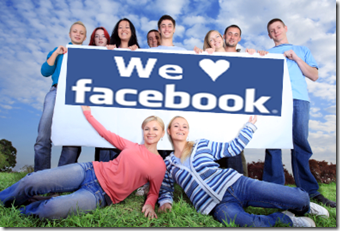 Given that over half of Facebook’s 400 million active users log in daily and spend an average of 55 minutes per day on the site, you can get your target audience to spend some of that time getting to know you, your brand, your products and services. The secret is to create a fan page with the right blend of ingredients that resonates most with your ideal fans. And to ensure they’re made to feel a strong part of your online community. As mentioned in Part 1, I’ve found there are essentially two components to Facebook fan page engagement: 1) Sharing quality, relevant content and 2) inciting comments. So, here in Part 2, we’ll talk about just how vital comments (and likes, wall posts and @ tags) are to the success of your fan page. For status updates, try ending with a question. 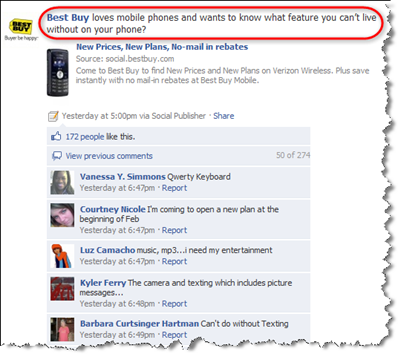 In the example below, Best Buy generated 274 responses so far to their question about what feature your can’t live without on your phone. And, in this example, Skype got 147 comments to their question about meeting your partner via Skype! The easier it is for your fans to read, the more likely they are to respond. Keep your status updates short and simple with one topic. You have up to 420 characters per update, but I recommend about half that for an ideal size. For longer updates, use the Notes app – or write a blog post and update. Get to know when your fans are most responsive. Depending on in which part of the world the majority of your fans are, you might want to post between 9:00am and 2:00pm in your timezone. 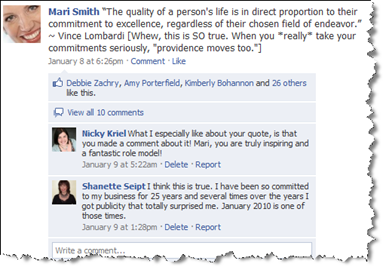 Do your best to respond to fan questions (as wall posts) as promptly as possible. If you find you can’t keep up with the volume of questions, offer a free teleseminar or webinar where you answer the top questions for your fans. You can do this in the traditional way of having people opt-in to get the phone number so you’ll build your email list at the same time. Add your own comment as needed to get the ball rolling. However, don’t step in too soon. I often find that the comments come more freely when you allow your fans to run by themselves initially. Acknowledge your fans often with simple thanks. Genuine recognition goes a *long* way! Don’t be afraid to stray “off topic” from time to time and surprise your fans. In other words, your content doesn’t always have to be directly related to your product or service. You might share an inspirational quote and add your own thoughts, for example. You can tag other fan pages that you’re a fan of and your own friends (along with Groups you belong to and Events you’ve RSVPed for). When appropriate, and used sparingly, @ tags can be a very powerful way to have your post show up on others’ walls, which gives you more exposure and brings more fans or potential fans back to engage. Give your fans a place to network with one another. Plus, often fans want to do self-promotion. You can encourage these types of activities on a specific discussion thread. 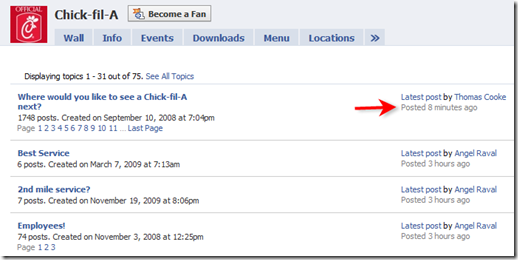 Also, when you first launch your fan page, be sure to start 3 to 5 discussion topics so it’s not a blank tab. In this example, the most popular discussion thread on Chick-fil-A’s fan page is asking their fans where they’d most like to see a Chick-fil-A next. Topics are always listed in order of the most recently commented on. If you’re a perfectionist, the goal is to get 5 stars and a perfect 10 score! Facebook uses algorithms to calculate your Post Quality as determined by the percentage of your fans who engage when you post content, calculated on a rolling seven-day basis. 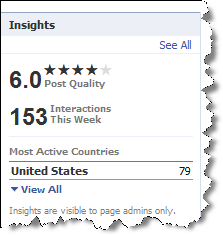 The number of stars depends on how your Post Quality compares to similar pages (for example, pages that have a similar number of fans). 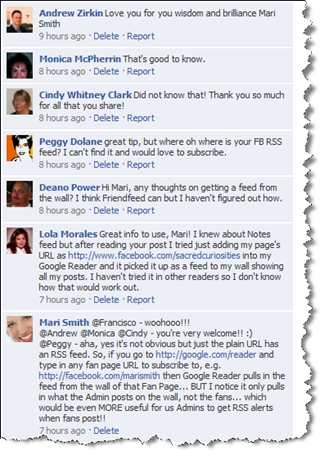 The more activity your fan page posts generate, the longer you’ll show up in the News Feed of your fans! As you build up your fan base, consistently add quality, relevant content and engage your fans. You’ll start to see results that translate into an increase in brand awareness and positive brand sentiment, email and blog subscribers, and of course, sales and paying customers. How are you engaging your fans? What did I miss? I’d love to hear from you. Add your ideas in the comments below. And do ask any clarifying questions as I’d be happy to answer you.